Through the Active Transportation Program, UC Santa Cruz will receive $434,000 for the design and construction costs, the second phase of campus bike safety project, and $365,000 for four years of educational outreach. With the new funding and funding awarded in 2017, UC Santa Cruz will widen and reconstruct nearly all of the bike path. The upper one-way sections and the lower two-way portions of the bike path will be widened to approximately 12-feet to meet current Caltrans safety standards, or as much as possible within the current path’s alignment. Between 600 and 1,000 cyclists use the path each day for commuting and recreational purposes. The campus hopes to significantly increase the number of cyclists through the safety improvements, the use of electric bikes, and the educational outreach efforts. In 2017, Transportation and Parking Services was awarded an additional $700,000 in design and construction funding from the Santa Cruz County Regional Transportation Commission (SCCRTC) to fund the construction project, which is in the preliminary design and environmental review phase. Construction is slated to start in summer 2020. The first phase of the bike path safety improvement project was finished in summer 2016 when the campus redesigned the bike path’s intersection with Village Road. That project was also funded through a $383,000 grant from the Active Transportation Program. With the new funding, UC Santa Cruz will offer bike safety trainings throughout the academic year—including sessions on riding electric bikes—as well as more helmet and light giveaway programs. The grant will help increase safe and more frequent biking to campus as a way to decrease greenhouse gas emissions, bike crashes, and one-person car trips. 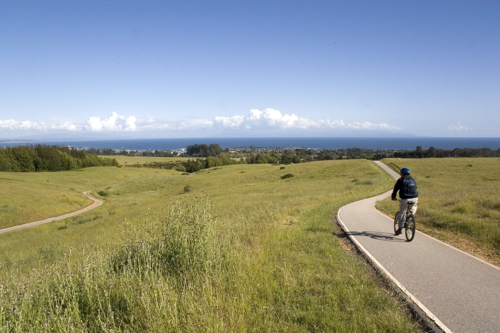 Ecology Action has worked collaboratively with UCSC over the last decade to increase bike safety, and this grant will greatly increase this effort and impact.